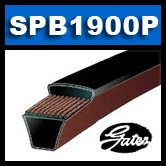 GATES SPB1900-P (Predator) Ultra Heavy Duty Single V-Belt SPB1900. Replaces Ametric SPB-1900 Belt. and PTO Belts > BladeRunner Outdoor Power Equipment Belts > BladeRunner 6402BR - Gates Outdoor Power Replacement Belt > B72 V-BELTS: B Section > GATES SPB1900-P (Predator) Ultra Heavy Duty Single V-Belt SPB1900. GATES SPB1900-P (Predator) Ultra Heavy Duty Single V-Belt SPB1900. GATES SPB1900-P (Predator) Ultra Heavy Duty Single V-Belt SPB1900. SMOOTH PROFILE Belt. Measures: 17mm Wide, 1900mm Pitch Length, 13mm Thick. Standard SPB-1900 Metric V belt. Metric V-Belt (Gates/Bando) XPB1900 Cogged Belt.